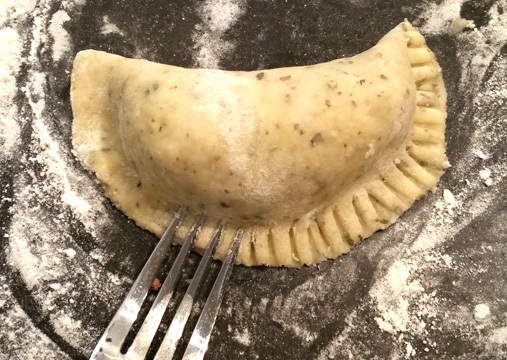 Savory Goat and Wild Mushroom Hand Pies | Have YOU Ben Starr Struck? 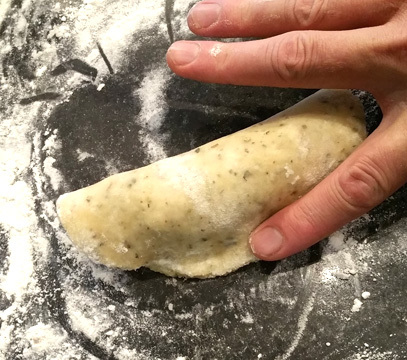 Empanadas, pasties, hand pies, meat patties, clangers, sfhias, kreatopitas…little meat pockets surrounded completely in crust and small enough to fit in the hand are popular across the earth, from Natchitoches to Nigeria, and from Jamaica to Jaipur. We recently served these rustic goat hand pies at a FRANK dinner, to nearly rabid acclaim. The flavor is just explosive…absolutely the definition of “savory.” You get a little twinge in the corners of your mouth with every bite. Goat meat is sadly under-appreciated in the US, for the most part. While several immigrant cultures cherish the unique flavor, which is somewhat similar to lamb, good luck finding goat meat in your grocery store. Luckily, a trip to a Latin American, Halal, Jewish, or Indo-Pak market will almost invariably reward you with what you’re looking for. 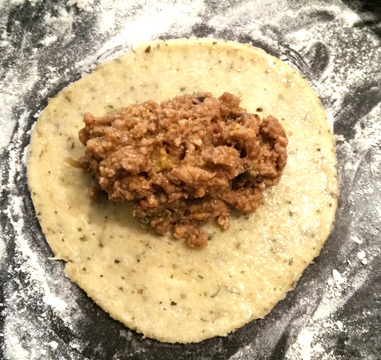 I like 80/20 ground goat for this recipe, with goat belly being the best and most flavorful. If you can’t find goat, you can almost always find lamb, though it tends to be more expensive. For the best flavor experience, I highly recommend lamb as a substitute. Failing that, use a nice, full-flavored custom sausage blend from your best gourmet market. Meat pies take a lot of effort. Don’t waste it on ground beef, pork, or turkey. I must’ve gathered 10 pounds of chanterelles in several days early this June, they were EVERYWHERE! This original recipe used chanterelles as the predominant mushroom. I foraged these during the wet, early summer here in Dallas, when they were plentifully growing beneath most oak trees in our suburban parks. 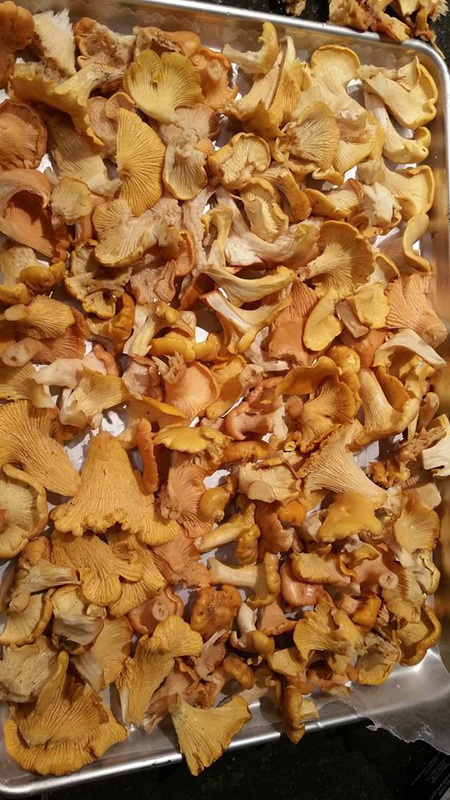 Chanterelles are actually pretty darn easy to find, they grow in every state but Hawaii, and finding them is FAR cheaper than the $40/lb or more you’ll pay to forage them in a gourmet market. But if it’s not chanterelle season where you live, and you don’t wanna fork over mega-bucks for them at the froo-froo market, you can substitute other mushrooms. Oysters would be my first choice, followed by shiitake caps (pull off and discard the tough stems), followed lastly by button mushrooms (ie creminis). Making the filling for this pie is sorta laborious…as is forming and filling them. This is why meat-pie-making is usually saved for special occasions in families that still consider them a tradition. I recommend making a big batch of filling (double or triple or more). Divide it into several freezer bags and toss them in the freezer. This way you only have to make the filling once a year, but you can have 4 or 5 meat pie dinners with far less effort. Because, trust me, after you make this the first time, people are gonna be begging for it. Also, you need to plan ahead if you’re going to serve this recipe. The filling needs to be made at least 1 day before, not only to allow the flavors to mingle and mature, but because the filling needs to be chilled when you assemble and bake the pies. 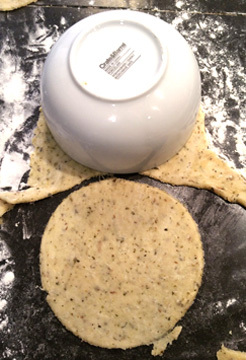 This recipe makes enough for about 12 meat pies if you cut the crust in 6″ diameter circles. Your mileage may vary based on how full you stuff them, how thickly you roll the crust, etc. Season the meat as it cooks with kosher salt, freshly ground black pepper, and some dried herbs…I like to use a little oregano or marjoram and some basil, plus a healthy amount of fresh or dried rosemary. Goat is a strong meat. It needs companions to make it shine rather than dominate. When cooking mushrooms, you should have only 1 layer in the pan. Any more than that and they will simply boil as soon as they release their water. It’ll take several rounds of cooking to get them all done, but the flavor and texture will be infinitely better than if you did them all in one batch. Add a sprinkle of salt as soon as they go into the pan, let them sit for a bit, and when you see them releasing their water into the pan, give them a stir. Stir every now and then until all that water is evaporated, and the mushrooms begin to brown. Pull them out of the pan and add them to the bowl with the goat meat, and cook the next round, adding fat to the pan as necessary. Let the filling cool to room temperature, then put into the fridge to chill overnight. This is a lard-based crust that I often use for savory pies. Click here to read all about how lard is MUCH better for you that butter. Don’t use the hydrogenated lard from the shortening section of the grocery store. Go to a Latin American market and get “manteca fresca” from the deli section…freshly rendered lard. If you can’t find lard, or just can’t bring yourself to use it, you can substitute an equal amount of melted butter or bacon fat, or use extra virgin olive oil for a healthier kick and a unique flavor. Whisk the liquids together with a fork and then begin incorporating the flour by pulling it into the liquids. Stir gently until there’s no more visible flour. Then knead gently in the bowl with your hands until the dough comes together. 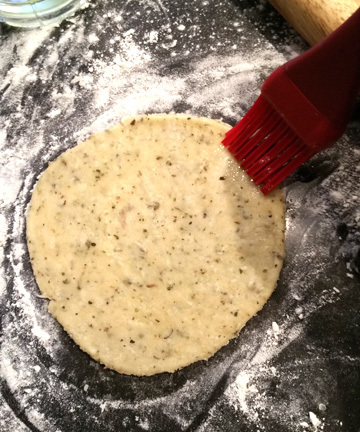 Brush the edges of the circle with beaten egg white. This will help seal the crust. Place about 1/4 cup of chilled filling in the center of the crust circle. Then take a fork and press down firmly around the border to seal the pie. After you’ve made about 6 pies and you’re getting into the swing of things, preheat your oven to 425F. Unless you have a quarter-sheet pan that will hold all the pies on a single rack, you’re probably going to have to bake on 2 half-sheet trays (the normal size for home cooks), so arrange your oven racks 1-spot up from the bottom, and 1 -spot down from the top. Continue assembling pies until you run out of crust or filling. Leftover filling can be frozen or turned into meatballs or meat sauce. Leftover crust can be rolled out and baked at 425F for 15-20 minutes and eaten as crackers. Gently brush the pies all over with beaten egg white. Place into the preheated 425F oven and bake 15 minutes, then rotate the pans and bake another 15 minutes. They should be golden brown when done. This entry was posted in FRANK, Main Courses, Recipes and tagged cabrito, goat, goat pie, hand pie, pasties, pastis. Bookmark the permalink.